All collectors of medals and many families searching for their ancestor's medals will be looking for a missing medal (or medals) to make a group whole again. Effecting a reunite is a holy grail, and generally takes luck more than anything. The internet and databases are improving the chances of a re-unite. The internet makes it possible to advertise for a re-unite using forums and message boards, databases allow records of medals offered for sale to be kept. The trick is now to unite the two to actively join the seeker with the seller. The Register makes this possible. The Register now shows records of QSAs and KSAs and other medals that have been offered for sale. There are over 17,600 records of medals for sale from auctions, medal dealers and also medals in a private collection, at least you know the medal exists. Amongst these records I have seen many possible reunites - some are listed below. Just this weekend records in The Register allowed me to contact a family researcher seeking a QSA to reunite with his great-grandfather's Distinguished Conduct Medal - QMS 1261 T Hogan, King's Royal Rifle Corps . The QSA had appeared on a dealer's list. The family researcher had originally posted a request on the British Medals Forum in 2013. You can use The Register to directly register an interest in a soldier by simply buying that man's record (or woman, The Register holds records for nurses). Every time that record is updated you receive an email telling you the record has been updated. The update could be new information or that a medal connected with that person has been listed for sale. Once purchased there is no further cost, you will always be eligible for update emails. Just remember to keep your email address updated. The Register is the only automated re-unite register actively linking searcher and seller. Try it! .............. and there are more. Of course the record medals sold works the other way: identifying splits which I blogged earlier. Research Puzzles are blogs showing examples of research where some of the usual pieces are missing, like service papers or a medal roll entry. Shoeing-Smith 3112 FL Hide 14th Hussars died of enteric fever at Fort Napier, Pietermaritzburg, Natal on 27th February 1900. He appears in the casualty roll, there are no service papers as expected for a casualty, no entry in Soldier's Effects. Surprisingly no entry has been traced in the medal rolls. The key to unlocking the history of Shoeing-Smith Hide is his memorial plaque. The best source for memorials is The Register. 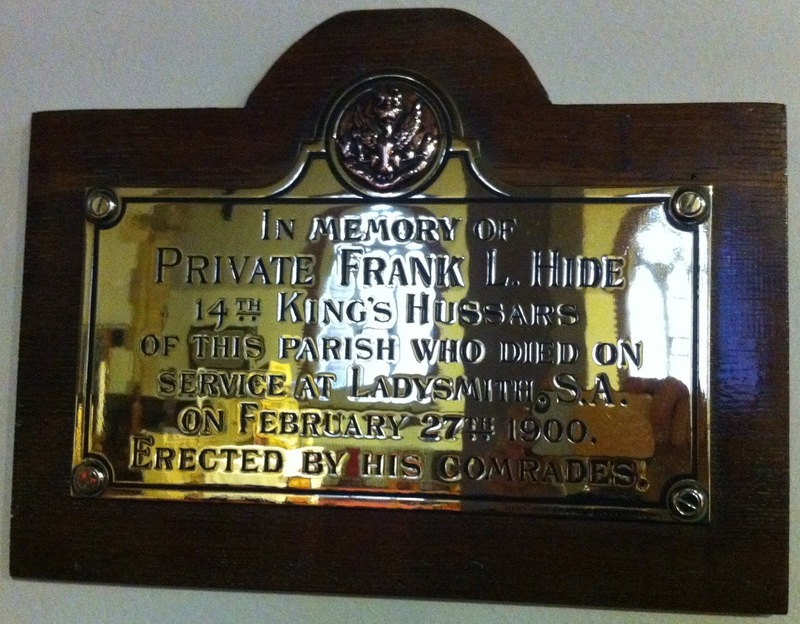 Hide's life has been commemorated buy his regiment who erected a plaque for each of their casualties of the War. Thanks to Christ Church, Seaside for opening the church. The memorial tells us his first name, "Frank" and with this and the location of the memorial, Christ Church, Seaside, Eastbourne, East Sussex you can begin genealogical research. Frank Leopold Hide was born in 1875 in Christchurch parish, Eastbourne to Samuel and Sarah. He was the third of 11 children. Frank enlisted into the 14th Hussars in late 1891/early 1892. In the army he learnt the trade of shoeing-smith. 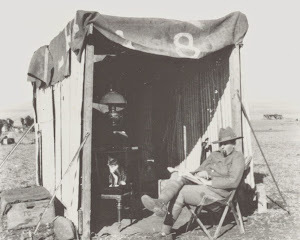 He served in the Anglo-Boer War in Natal with the Natal Field Force. The lack of a medal roll entry is unusual for a soldier. The cavalry rolls have been databased are on The Register. His omission from these rolls and his trade of shoeing-smith indicate that he served with the Remount Department in Natal. There are separate rolls for the Remount Department, these have only been fully databased by Ancestry whose index is highly suspect. A manual search of the Remount Department rolls have failed to find an entry for Hide. Hopefully one day his QSA will surface. Four brothers of Frank served in the military, one Sidney Hide died during WW1 wounded at Gallipoli with the Collingwood Battalion Royal Naval Division. If you have any Research Puzzles you need help with - please email me. Research Puzzles are blogs which are examples of research where some of the usual pieces are missing, like service papers or a medal roll entry. The QSA to Pte 4885 FC Froggatt 7th Hussars is currently offered by London Medals (this link will break when someone buys the medal). Froggatt earned the classic "state and date" combination of clasps: Cape Colony, Orange Free State, Transvaal, South Africa 1901 and South Africa 1902. On the surface this is an "ordinary" medal, very common for the War and without a battle bar to give any indication of what action Froggatt saw. Additionally there are no service papers, a dull medal then? However by looking around and delving deeper we can construct a story of "the man behind the medal". There is a WW1 Medal Index Card for a Pte FC Froggatt, 18th Hussars (5401) and 14th Hussars (4/47513). The card is stamped "1914 Star" and contains the remarks that Froggatt's application was forwarded by the OC Reserve Regiment of Cavalry (India) with a disembarkation date in 1916. The MIC also shows the application was turned down. Curious. But, is this the same FC Froggatt as fought in the Anglo-Boer War? Additionally in The Royal Tank Corps Enlistments on FindmyPast there is an entry for Pte 19139 Frederick Charles Froggatt. This shows he transferred to the Tank Corps on 22-05-1919 from the 14th Hussars number 47513. We have a link to the MIC, but of the link to the QSA? The Enlistment shows Froggatt enlisted into the army on 16-10-1899 at Great Yarmouth age 19 years 6 months, a clerk. So, he is old enough to have fought in the Anglo-Boer War, but what is the connection between the QSA and the MIC? The MIC and the Tank Corps enlistment make no mention of the 7th Hussars, the regiment Froggatt fought with in the War. Using the Army Service Numbers 1881-1918 blog we can estimate the year and month of entry just using a service number. Looking at the two four digit numbers for the 7th and 18th Hussars, the five digit 14th Hussars number was issued from 1916 onwards. Number 4885 7th Hussars was issued October 1899, number 5401 18th Hussars was issued October/November 1900. The enlistment date into the 7th Hussars number 4885 matches the enlistment date given on the Tank Corps enlistment. We now have a link between the QSA and the Tank Corps. How can we explain the MIC, which does not mention the 7th Hussars and the four digit number for the 18th Hussars which was issued in 1900 when Froggatt was with the 7th Hussars and remained with them until after the Anglo-Boer War. The QSA medal roll does not contain any remark to show Froggatt came from or joined the 18th Hussars. From January 1907 all service numbers for hussar regiments were issued centrally, number 5401 was issued in March 1910. Enlisted 1899 into the 7th Hussars for 12 years, fights in the Anglo-Boer War, transfers to the 18th Hussars March 1910 and is given a new number 5401. Froggatt's service expires 1911, he is either allowed to extend or joins the Reserves. At the outbreak of WW1 Froggatt is with the 18th Hussars, takes his discharge "time expired" and rejoins or is conscripted in 1916 into the 14th Hussars and is assigned to a Reserve Cavalry Regiment, presumably in India. Returning to the UK he is transferred to the Tank Corps in 1919. In January 1920 he is discharged and elects to join the 47th bn Royal Fusiliers who are stationed in Germany, and there the trail goes cold. While we don't know what happened to Froggatt after 1920 the Tank Corp enlistments gives us vital and really interesting biographical data. Froggatt was born in Buenos Aires, Argentina, the son of RW Froggatt who was living there in 1919; great start for more research. A humble "state and date" QSA now jumps to life with a little research and use of underused tools like enlistment dates. And of course we need to discover what the 7th Hussars did during the Anglo-Boer War - that's another blog.